Home How to Pinterest How to Block Someone on Pinterest? How to Block Someone on Pinterest? Pintererest is very popular social network site for sharing photos and videos. 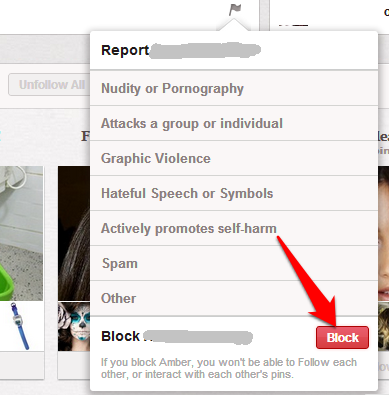 If you want to block someone on Pinterest below the simple guide tells how to block someone on Pinterest. If you blocked anyone, you wont't be able to follow each other pins. That's all you are successfully blocked that person, so here after you wont get any updates from him and also he cannot see your future updates.